The Designer’s Guide to Git or: How I Learned to Stop Worrying and Love the Repository. The designer’s toolset seems to be always expanding. Long gone are the days when a web designer can rely solely on an HTML editor and Photoshop. Now, especially when working in a team with developers, you need to work smarter and more collaboratively. In this post, I’m going to discuss using Git. Git is version-control software, originally created by Linus Torvalds (the creator of Linux). It’s main purpose is to track changes to files, so that you can better manage your work. As a designer, why should you care? Why should you learn a command line to use version control software? In essence, it keeps track of all the changes to your files in a project, so if you break something, Git will be there to help you get back on track. Its powerful tools let you view your changes, helping you fix your code so that it’s free of a certain bug, or see exactly who broke your precious code. It does, however, have a mantra among its users: Git will do exactly what you say, but not always exactly what you mean. So in this article, I’ll cover both the right way to use it, as well as common pitfalls that would otherwise cause you problems. Most source control systems (Git included) use the concept of a tree to describe a repository. A repository is a collection of files and directories (your project), as well as a list of changes to those files over the life of the repository. The master branch, sometimes referred to as “the trunk,” is the current state of the files in your project. You can create additional branches from the master branch, depending on your needs, or the way you work. Branching creates a copy of a branch, typically the master branch, so that it’s now independent of the one it was created from. It enables you to have a clean slate to make changes to your heart’s content, and when you’re happy with them, you can merge them back in. Merging is like the opposite of branching. You have two branches, and you can merge one branch’s changes into another. At the end of a merge, you still have two branches, but one branch’s changes are now also on the other branch. Feature branches are a branch off the master branch, and a common way to work when you start on a new feature of your website. When the feature is complete, you can merge it safely back into the master branch. This way, managing the features you’re working on is easy: you can have a whole set of features for a project in progress, and merge back into the master only the features that are finished and working. To start using Git, you have to install it. Head to http://git-scm.com/download to find installers for your operating system. git init steps up a blank repository. It will return Initialized empty Git repository in /Users//sitepointexample/.git/ letting you know your repo is ready to use. It’s quite common to have a remote master. A remote master is a copy of the repository (usually on a server that’s accessible by all the development members of your team) that you can push or pull changes from/to. I’ll skip going into this in any depth; there are many resources on the Internet that will explain this in more detail. There are six basic actions you can do with Git. This is by no means all you can do, but in your day-to-day tasks these are the six that you’ll use most often, in this order (apart from merge, which you’ll use less than the other five). Most likely, you’ll learn these by rote; you will definitely use them a lot! git status shows you everything you need to know about the state of your repository. It shows which branch you’re working on, what files have been changed since they were last committed, and which files Git knows nothing about. It will indicate if files have been moved or deleted, or if there are merges that need to be made manually. Tracked changes are files that have had git add run on them. These files would be committed if git commit was run. Untracked changes haven’t had git add run on them, and there are changes that Git knows about, but will do nothing with. Untracked files are files Git knows nothing about. They are either new files or files that have never been added to the repository. git status is the first command to use. Do it before you do anything else, every time. So I’ve added the README file, and another git status tells me that when I commit, Git will commit the changes to that file. In case you’ve added changes in error, you can undo the changes by running git reset HEAD <filename>, which tells the repository not to do anything with the changes. It will not drop any changes you’ve made; it just won’t commit them. I’ve committed the changes to the file with the --message 'My First Commit'. These are handy hints you can write when you’re checking through the commit log looking for a certain change you made. Make these as descriptive as you can. They save you lots of time when something goes wrong. You can also use -m 'MESSAGE' instead of --message 'MESSAGE' as a short form, saving you time. We use GitHub, a company that hosts repositories. They have excellent documentation and help online. Check them out. The remote branch is origin/branchname. Typically, origin means the remote server hosting your repository. 36aeed8..8c18ec5 are the two commit ids: what this means is that Git is updating from the first commit (which you had on your machine, being 36aeed8), to the second (8c18ec5). Two files were pulled down, and one of them (create mode 100755 /Resource/file.php) was a new file in your repository. It was added by another member of the team. git merge is used when you have two branches, and you want to take the changes from one and add them to the other branch. git branch otherexample creates a new branch, called otherexample. git checkout otherexample switches to that new branch. git branch shows what branches I have available. It tells me I have two branches, master and otherexample. [FYI: git branch -r shows what branches origin (the remote server I alluded to earlier) has]. touch OTHERFILE, git add OTHERFILE, and git commit -m 'Other File Added' create a new file on the new branch, tell GIT that you want to commit the change, and commit it with a message of 'Other File Added', just like the steps above. git checkout master jumps back to the master branch. 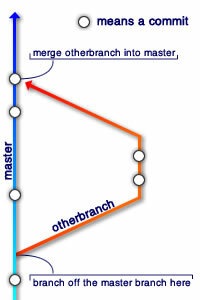 git merge otherexample takes the changes on otherexample and merges them into master, the branch you’re on. You can see that it has created the file “OTHERFILE” in your master branch. git push will push your changes to the remote server, sharing them with your team. When they next git pull, they’ll see your changes. git push origin master is usually how it’s used. The difference between git push and git push origin master is that the latter will only push the master branch, while the former will try and push all branches. It would be used, for example, when you want to push just a single feature branch, so that a team member can also see the changes you’ve made to ‘otherbranch’, and you’d use git push origin otherbranch. And they are the basics of Git. It is, however, a complex beast. There are many, many more commands—some are really helpful, while others are a little dangerous. You can pick out a single commit and merge it into your branch, ignoring all commits after it. You can use Git to find the exact commit where your code was broken. You can roll back to an individual commit you made earlier in the day, the day before, three weeks earlier, or any time along the repository’s timeline. As the designer’s toolkit expands, we need to take advantage of handy workflow tools that make the most of our day. Use Git, and never lose all your changes again.